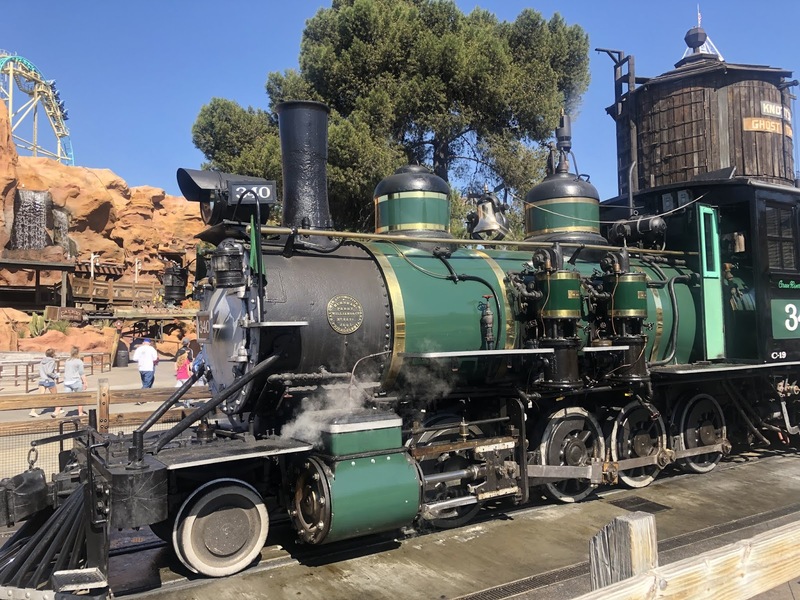 Today was spent at Knott’s Berry Farm which is a few miles north of Disneyland. It has a lot of amusement park style rides including a large number of roller coasters. We didn’t go on any of those. 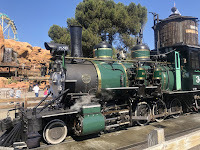 This is a full-size steam locomotive versus the 3/4 scale one at Disneyland. It’s a low-thrill ride. Knott’s Berry Farm classifies all of their rides 1 through 5. 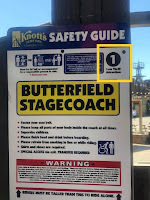 I believe the train is a 1. 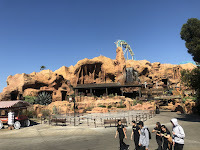 We went on the Calico Mine ride. This is one of the first rides here that used animatronic characters. All of this was really high-tech back in the 1960’s. We used to visit this park before it was a theme park. Admission was free and they sold tickets to the rides. Needless to say, we didn’t go on that many rides. They started charging for admission when people would just hang around the park all day (and night). Back then, the stagecoach ride was something that I never remember doing. Probably because it was one of the more expensive tickets due to the overhead. A lot of people plus horses and not that many people per hour. Of course, this ride broke down while we were riding it. When heading up a hill, the horses stopped and wouldn’t continue pulling the stage coach. It took almost five handlers to get the team moving again in a straight line. The driver said that each horse would pull and if they didn’t feel the other horses contributing, they would stop and wait. Anyway, we got an extended ride. We were up on the roof just behind the driver. Bridget collects these smashed pennies from every tourist place we visit. This place was a gold mine for smashed pennies. They must’ve had ten machines each with three different pictures. I think she settled for four. 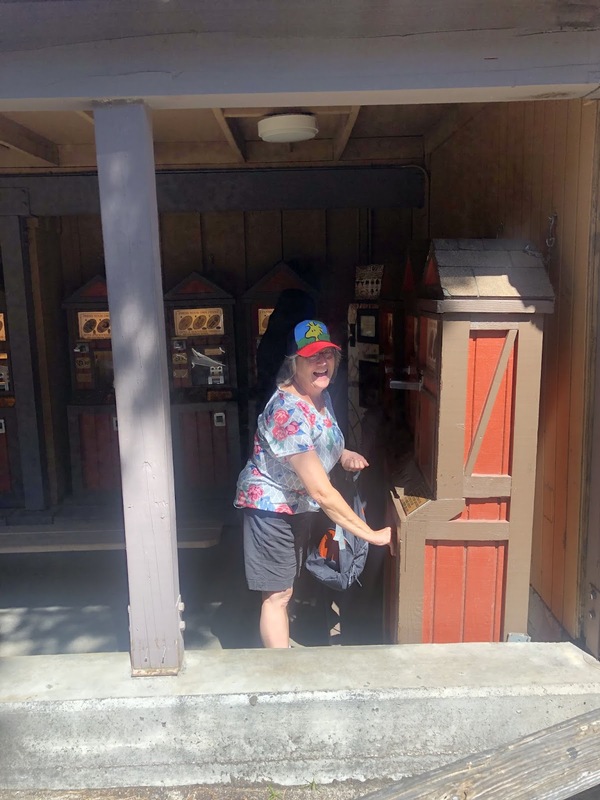 The Woodstock hat is a new one from the Peanuts store just outside of the gate. 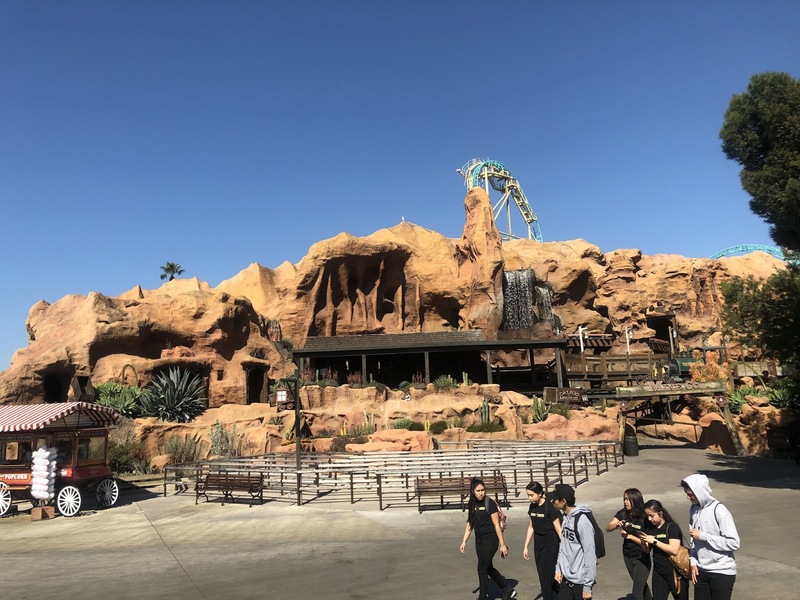 This is the Calico Mine ride. I remember when this ride opened. It was a big deal. We ended up riding it a couple of times today. Compared to yesterday’s crowds, today was very pleasant. There were a lot of school age groups but we didn’t have to wait very long for any of the rides. 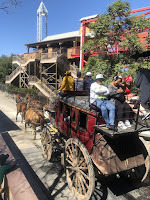 The stagecoach was a long wait but only because of the small number of people on each ride and only one stagecoach running. Most of the rides we just walked on or maybe waited in line for five minutes or so. 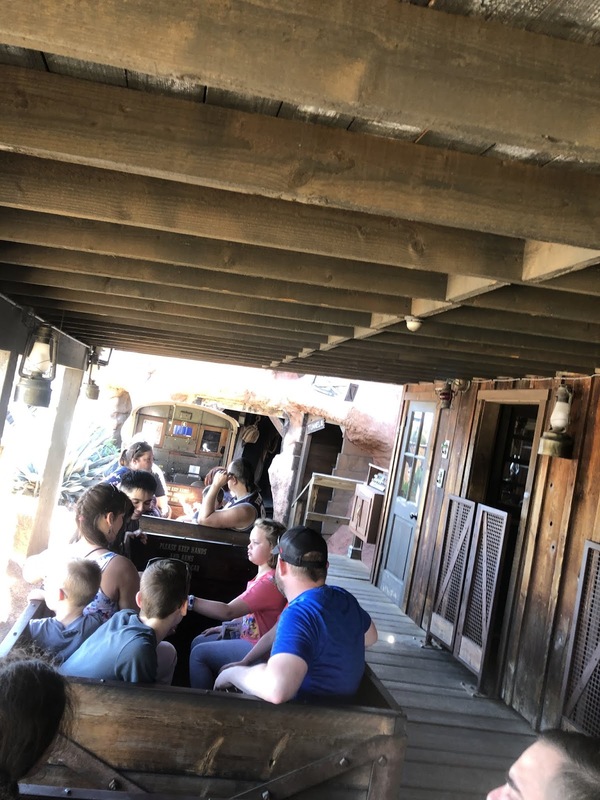 This was the warning side for the stage coach ride. As you can see, it was also a low-thrill ride just right for seniors like me. BTW, I did get a $10 discount as a senior. They figured correctly that I don’t go on very many rides. 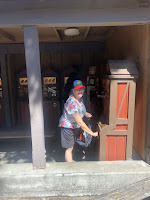 We ended our day here at Knott’s by having their famous chicken dinner. Even that place changed from what it used to be. Back in the day, they had one thing on the menu and that was fried chicken. And they used to print the chicken recipe on their paper placemats for you to take home. Not any more. I must admit that the chicken didn’t taste as good as some others but the price is decent. And, if you’re like me, you have a lot of pleasant memories of this place. We went here often while I was growing up. Yesterday Indiana Jones broke down while we were on it. Today the stagecoach broke down (horses stopped) What will break tomorrow? I look guilty getting my smashed pennies. Only a total of 4 today. Need a new book to keep them in. lol. Cheapest keepsake memory! Are you going to be bringing your TW around to test the theory? Not while you’re in that high tax state!